Date of Publication: First edition 1993; Second edition 1995. Purpose: To expose a significant error in traditional biblical chronology (e.g., Ussher's chronology), and to show how to correct the error. 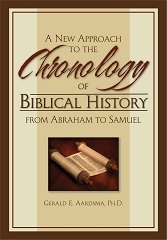 The corrected chronology allows biblical dates prior to the time of Samuel to be properly calculated for the first time. This enables biblical and secular records of the ancient past to begin to be properly harmonized.